Those who underestimate Lord Baelish do so at their own peril. Littlefinger has not, strictly speaking, been among the most significant characters on “Game of Thrones” this season. Jon and Daenerys just had their long-awaited first meeting, which was as tense and eloquent as we’ve been hoping; Cersei and Jaime are once again proving that, even and especially when their backs are against the wall, their claws are as long and sharp as ever; Euron is filling the void left by Ramsay Bolton and positioning himself as the show’s newest villain. Petyr Baelish has found himself waiting in the wings of late, but on last night’s episode we saw him briefly emerge from the shadows to offer advice to Sansa — and, perhaps, to us as well. That this happens while Jon is far from Winterfell attempting to persuade Daenerys to part with her dragonglass is no coincidence — nothing ever is with him. We’ve seen Littlefinger attempt to drive a wedge between Sansa and her half-brother (who’s actually her cousin, not that either of them know it yet) since the knowing look he gave her just moments after Jon was declared King in the North. That was clearly a sign of things to come, which are coming into clearer focus with each new episode. 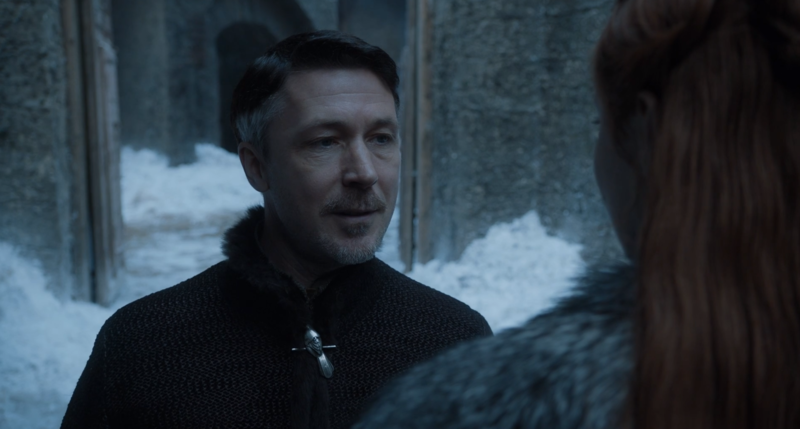 Sansa has so far done an admirable job of rebuffing Littlefinger’s increasingly obvious attempts to manipulate her; just moments before this speech, she’d sarcastically thanked him for his wise counsel after he warned her to be wary of Cersei. (Also not to be forgotten: her incredible burn from the premiere two weeks back in which she said, “No need to seize the last word, Lord Baelish. I’ll assume it was something clever.”) Perhaps aware of her distrust, he offers her a genuine glimpse inside his five-steps-ahead mental process. It’s not only Littefinger’s most arresting speech since the character-defining “chaos is a ladder” monologue from season three, but one of the few times he’s offered real advice that, at least on the surface, doesn’t come with an ulterior motive. Think how many clever people we’ve seen lose the game of thrones — the ever-intelligent Olenna Tyrell perished just this episode, and Dany’s best-laid plans for conquest are already falling apart. Simply surviving counts as a victory in Westeros, and few have proven more adaptable than Littlefinger. Better men have died because of him, and braver warriors have been felled as he stood back and watched. As the show moves ever closer to the end and even more key players depart, we’d all do well to follow his advice so as not to be surprised — or, more likely, devastated — by what happens when the last few pieces move into place.